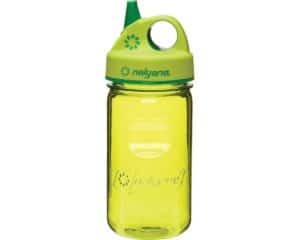 This Nalgene Grip-N-Gulp has side indents that are easy for tiny hands to grasp. Soft touch lid makes drinking comfortable and it has superior threading on cup and lid is engineered to prevent spills. Cup, lid, and removable sipper valve are all top rack dishwasher safe. Lid loop can be clipped to backpack, diaper bag or stroller. Cup is compatible with OTG, ATB and wide-mouth closures. Indestructible, translucent, odor, stain and residue resistant.